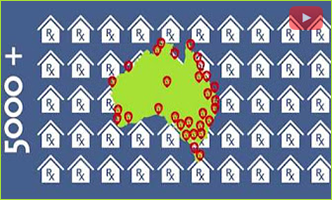 At this time, iTherapeutics is available to Australian Pharmacy Stores. Your registration will be verified by our staff before full membership is activated. Once you have received an email confirmation of your membership please login to the site and commence the vast array of education modules available to you. If you already have an iTherapeutics account set up, please do not register here. Please contact us for your account details or any assistance. Otherwise, you could risk losing your training history and the iReward points that you have already accrued. * Denotes a required field and must be entered. * Title -- Please Select -- Assoc Prof Dr. Miss. Mr. Mrs. Ms. Prof.
You can either use the search facility to find your store using Option 1 OR Use Option 2 to browse by group and follow the steps to finding your store. Please use the search facility below to find your store. Search Store by: Name, Street or Postcode. The product education modules on iTherapeutics AU have been made available to you free of charge through the support of the participating companies. When you complete an education module, the relevant company is notified accordingly. This enables the company to provide additional information upon request and makes you eligible for any rewards program associated with the education module. We will also email you when new modules, programs or rewards become available (Please note your email address will not be disclosed to any third party).